I grew up in Encinitas, California with an overwhelming love for sports; in particular, softball and basketball. I joined Girl Scouts in the 1st grade as a Brownie. I was always taught to follow my dreams, and work hard towards my goals. Growing up, I was fearless! I was a horseback rider, swimmer, golfer, basketball and softball. I loved softball so much that I decided to join baseball camp with the boys because they didn’t have any softball camps at the time. It was tough, but I was awarded the best player of that camp as the only girl! I was able to shine bright as a leader, and was voted team captain of every team that I was a part of. I decided to set myself up for a future doing what I love, and work in sports. I earned a Master’s degree before the age of 23, and am working in a field that I love, while also advocating for diversity and inclusion in athletics. I have always been a go-getter, especially when others were doubting me! I love to be able to prove others wrong and accomplish the impossible. You can either take negative comments and let them keep you down, or you can use them as fuel to go after your dreams. I have been an innovator in my current role by including the Girl Scouts! I have tried to be more inclusive and make sure that the Girl Scouts have opportunities to meet and be involved with collegiate athletes at the University of Colorado. 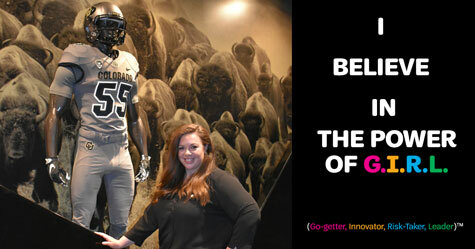 I took a risk by applying to a Master’s program at the University of Colorado, Denver. I had just graduated from an excellent business school, but knew I needed more to accomplish my dreams. I moved to Colorado without knowing a single soul here, and it led me to amazing opportunities working with the Broncos, Buffaloes, Wimbledon, and the Special Olympics. I am a leader in every aspect I can be. I take control on projects at my current job such as: Healthcare Appreciation Day, Scout Day, Hispanic Heritage Day, and Youth Day. I am currently one of five millennial Latinas accepted to University of Southern California’s Latina Global Executive Leadership Program. I truly believe that working on yourself as a leader will be a constant, lifelong journey, and you can always improve! To take the lead often means to take on responsibility. As a leader, you have to have faith in yourself and your vision, and inspire others to work towards a common goal. It takes discipline, and an overall understanding of how others around you operate. Although you are in control, you have to create an environment where others can be of value and show their own leadership qualities as well. Great leaders don’t just lead, they help create more leaders. Girls and women have historically been overlooked. It is important for us to take the lead and own our power. We bring A LOT to the table, and don’t let anyone tell you otherwise! Often, qualities that pertain to women are seen as weaknesses. But, as we evolve, we have come to realize that those exact qualities are what makes us powerful and are very valuable assets to any organization! To this day, I am still the only female on my team and work in a male-dominated industry. It’s important for women in athletics to continue to take the lead, and show girls that just because lots of men are leaders in the sports industry, doesn’t mean we can’t also have leadership roles. Finding power within myself is what helped me get through the door. But supporting other women, and in return, gaining support from other women has brought me a power that I have never known! Perseverance is also incredibly important. There are going to be hard times, and times you’ll want to give up, but pushing through those times and realizing what you do is for a bigger purpose, you realize you can never give up! I was a Girl Scout for a while, and it truly taught me to cherish the relationships and memories that I made with other Girl Scouts. When we stand together, the relationships and connections we make will carry us through more than you ever imagined!